Thank you, everybody, for joining us today. We are promoting "THE MOMENT" and we've had so many great moments promoting this event. I find this call to be one of our special moments because we have none other than the pound-for-pound king, Floyd "Money" Mayweather available to talk to you today. He, of course, is a 10-time five-division world champ and the current WBC Welterweight World Champion. You will be receiving your fight week schedule very shortly and it will give you all the details for what's to come next week as we prepare for the fight week of the May 3 bout. So without further ado, I'm going to turn it over to Leonard Ellerbe, Chief Executive Officer of Mayweather Promotions, to make the introductions. I'd like to thank everyone for joining us on the call today. We're just 10 days away from "THE MOMENT." Will this be the moment that Maidana shocks the world and becomes victorious? You just have to see. Will this be the moment that, for the first time, Maidana gets stopped? You have to just wait and see. Obviously, this fight will be brought to us by none other than SHOWTIME PPV® and without further ado, I'd like to introduce the man who controls and runs everything at SHOWTIME, none other than the Executive Vice President and General Manager of SHOWTIME Sports, Stephen Espinoza. Just a couple of programming notes before I turn it back over to Leonard and to Floyd. We will be premiering Episode 2 of All Access this weekend, 6:00 p.m. Pacific, 9:00 Eastern immediately preceding our three-fight, heavy hitters card. If you missed Episode 1, it's available just about everywhere from the SHOWTIME website to On-Demand, SHOWTIME Anytime and YouTube and virtually everywhere else. We were also well into our pre-fight programming on SHOWTIME OnDemand and SHOWTIME Anytime as well as many other places. We are already featuring classic Mayweather fights, classic Maidana fights and many of the undercard fighters from J'Leon Love to Adrien Broner to Amir Khan, but I know you are all anxious to hear from the champ, so I'll turn it back over to you, Leonard, and I will see you all next week. So without further ado, TBE, the man himself. 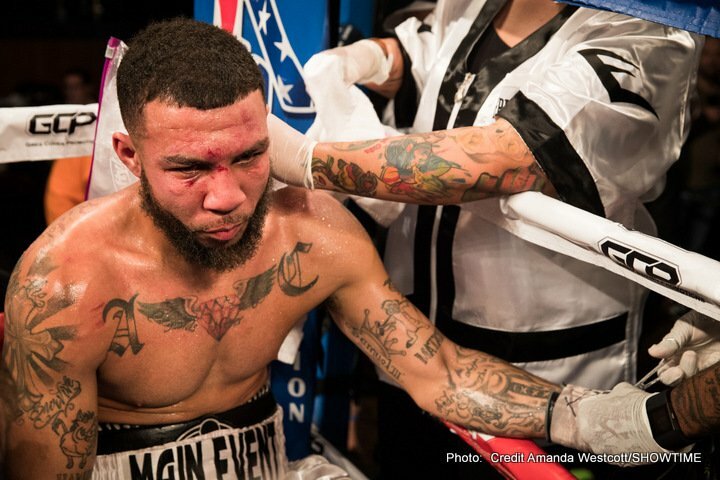 First, I want to thank Stephen Espinoza, I want to thank SHOWTIME, I want to thank CBS, I want to thank Leonard Ellerbe, I want to thank Al Haymon, I want to thank Richard Schaefer, I want to thank Kelly Swanson, I want to thank everybody, all the networks and all the people that are covering this fight and all the people that have covered my fights throughout the years. I want to thank you guys and I just want to say I really appreciate you and everybody that's a part of the event and that helped get these events started, "THE MOMENT". I couldn't choose a better team, because we work as one. I know Maidana is going to come and bring his best, so I know that I cannot overlook him, so I'm in training every day and dedicating myself. What were you able to do, in terms of the promotion, that you all were able to put together, such an amazing card? Yes, the card from top to bottom is stacked. 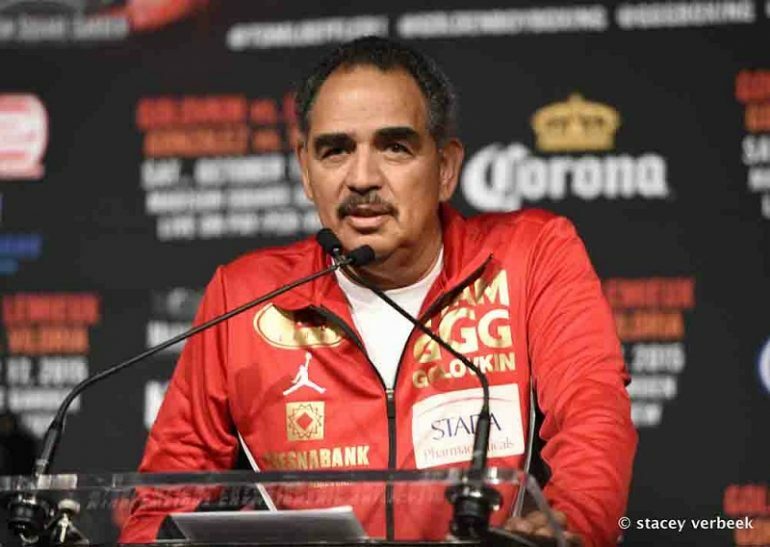 We felt as though the fans; it's all about giving the fans the value for their money, and that's what Mayweather Promotions and Golden Boy Promotions is about when we're putting on these major events. Can you just talk about your relationship with Leonard and why that has been so successful and so stable over the years? This is something a lot of people don't know. Let me enlighten people on the story with Leonard Ellerbe. Now, Leonard Ellerbe had not a good job but a great-paying job in D.C. He's from D.C. Had a good-paying job, and people don't know how Leonard got with me. Leonard came out here. Leonard used to go on trips, used to pay his own way to go on trips with us and just help out, and he used to leave his job. He'd leave his job and fly on his own money because he had, I think, it was a six-figure paying job. He also was a fitness trainer. He had another job, so he was making very good money. He left all that, paid his own way to come support me, and one particular time he was doing some charity work for me. He was doing everything to make sure I got up to do my runs, he was doing security work for me and everything, and all he was making, it wasn't big money because I was making good money but I wasn't paying him what I feel like I should have been paying him. But you know, times have changed. He stuck with me through thick and thin. We've been through a lot together. He stuck with me through everything. I'm happy to say he's a multimillionaire now, so I feel like it was worth it, the wait was worth it, and we go through a lot. A lot of times people don't see we go through a lot. Because we strive for the best. We strive for the best, but at the end of the day it's about communication and one thing that we can do, I respect him as a man, he respects me as a man and we can communicate, and I will always love Leonard Ellerbe. He's doing a tremendous job. If I could make one addition back to your first question, there are some things that Floyd and Leonard are actually I think a little too modest about, so I'll go ahead and voice this for them. As you've heard from Richard and Leonard in the past, this is the most expensive undercard in the history of pay-per-view undercards. To be more specific that is an investment by Floyd and by Mayweather Promotions. So all credit goes to him for investing not just in this event but in investing in the growth of the sport because from the network perspective, it is only through events of this magnitude that we really grow to the casual fans. When we talk about appeal to the casual fans, Floyd is head and shoulders above everyone else. This is not a card that we needed to support this event. This was something that Mayweather Promotions went above and beyond to do and took money out of their pocket to do so, and I think that needs to be recognized as an investment in the sport. When you have been devising the game plan for Marcos Maidana did you or your team feel as though it was really Devon Alexander that laid down the blueprint to defeat somebody like Maidana? I think that what's different is Maidana may not be accustomed to fighting southpaws, so that could have played a major key into his fight with Devon Alexander. Also he was fighting on Alexander's turf and I think the difference between me and Alexander, he's a more straight-up boxer. I think he's a more straight-up boxer but I think when Maidana's facing me his confidence is built after he beat Adrien Broner because he feels that both of the styles are very, very similar, so it's like the same style. I think he's more confident now than he was when he faced the kid from St. Louis, Devon Alexander. I think he's more confident now, so I think he's more ready and tough. If you have more confidence it's going to make you fight harder. Is Maidana as good as he was against Broner? Is he as bad as he was against Alexander? Or is he really average, in between there somewhere? You know, I can't really say, but one thing that I did notice, as some of you know I look at a lot of things. I don't have anything against anyone, but I noticed that when the guy, Alex Ariza, was in Amir Khan's corner and when he faced Maidana, Amir Khan looked super strong in that fight. Then you go back and look at it, I go look at Maidana's fights against certain guys, like when he fought Alexander, he was strong, he was still coming ahead because he's the kind of guy that comes straight ahead, and liked the looped shots. He wasn't as strong as he was in the Adrien Broner fight. In the Adrien Broner fight he was a lot stronger than he was in a lot of his past fights. So you know, I don't know if Alex Ariza plays a major role into that, but when I sit back and I look, I'm looking at Pacquiao versus Bradley and I notice ever since Ariza has not been with Pacquiao anymore there's been a total change in his power. So I look at things like that and I question things like that to myself, but I don't worry about anything and I'm not going to say nothing about Ariza because I think he's a pretty cool guy. I don't really know him, but we got USADA, which is the best in the world, and we're going to continue to go out there and do what we supposed to do. To touch on what Floyd just said, I have got firsthand information on the Maidana-Alexander fight. He (Maidana) was asked to pull out the fight because he was very, very sick. He was asked to pull out but he refused to. He's not one, obviously, to make any excuses, but the facts are what the facts are. Floyd, you mentioned the Pacquiao and Bradley fight. Did you watch the fight? What were your thoughts on Pacquiao's performance. Yes, actually I did watch the fight. You know, I haven't seen Pacquiao fight in years. I've seen highlights. I haven't seen Pacquiao since before Miguel Cotto. I thought that he deserved congratulations. He's the better man, but as far as Bradley, whoever he's working out with, they have to make a lot of changes because he's lifting too many weights. I think he's more worried about how he looks when he get on the scale instead of how he performs inside that ring. I thought that Bradley went out there and fought his heart out, but I think he was pulling a lot of shots like an amateur. I think he was making a lot of mistakes and he was very fatigued early on. I think that he was making a lot of mistakes, falling off balance and fighting like an amateur. I think both fighters fought like amateurs. I thought Pacquiao fought like an amateur also, and I wasn't pleased with his performance, but he got the victory the best way he knows how, but I wasn't pleased with his performance and I'm seeing something totally different in Pacquiao. So FightHype had a story out that I was looking at that was very interesting. You go read the story when Freddie Roach was saying that he didn't know what Alex Ariza was giving his fighters. He didn't know what he was giving his fighters. So go read the FightHype article. Pull it up. It was kind of crazy when I heard that, but like I said before, I don't see the same pop in Pacquiao's shots. Once again, I'm not saying this guy is doing anything, but I don't see the same snap in his shots. He's getting tired when he wasn't getting tired before. I'm seeing something totally different whereas me, I'm still sharp, I'm still smart, I'm not getting fatigued. I wasn't getting fatigued from the beginning, and those are the things that I see. I don't know if you guys see it, but that's what I see. At this time in your boxing career, what is most important to you - your legacy or business or what? A little bit of both. Of course, I want my name to go down in history as the best, but just making smart business moves to be very lucrative and build your portfolio. What fights do you feel like so far define your legacy the most, Floyd? I can't really say. I really don't know. I've been in so many career-defining fights I can't really choose one particular one, but all of them played a major role, a very major key. Can you kind of characterize what's going to happen in this fight? And also, how big are body shots going to be in this fight, because a body shot is what Khan dropped him with in the first round. My focus is this guy. I'm pretty sure he's going to be well-rounded and ready for this fight because this is at a total different level. Against Amir Khan, the guy could have been doing a lot of sit-ups and making his body in tip-top condition and tip-top shape. Amir Khan could have just caught him with a good shot. My body is in very good condition, but sometimes a guy can hit me with a good shot and I can feel it, but we just don't know how we're going to approach the fight. We're going to take our time and go out there and if a guy leaves an opening on his face, we're going to take it, if he leaves an opening on his body we're going to take it, but we can't just say we're going to go in there and everything is going to go to the body. We're going to take our time and pick the guy apart. Are going to be staying in the pocket - is that what you meant when you said that? We must realize that I am the bigger guy even though I walk around at 150. I go no higher than 152. I'm naturally the bigger guy because I've been at 147 almost 10 years now, so I'm naturally the bigger guy. I think that my dad has the game plan to stay in the pocket, make the guy miss and make the guy pay. Can you describe what you see from your vantage point and what you look for in a fight? Well, I can see the shots. Actually, I can feel when a guy's gonna punch. I can feel it. I don't even have to see it; I can feel it. You know, this is just with experience and being around the sport so long. I can just feel a guy when he's going to shoot his shot. A lot of times guys telegraph their shot. Their body language gives away when they're going to shoot because of how they position themselves. So when a guy positions himself in a certain way you know what shot he's going to throw, but my thing is whatever a guy's best attribute is, whatever he does best, my goal is to take that away from him and make him resort to doing something else. What does Maidana do best? Well, he punches extremely hard if he has an 80 percent knockout ratio. That's obviously his best attribute, but a lot of times when a guy's swinging a lot of big shots and they're not landing, you get fatigued like that. You and Al Haymon will be honored two days before your fight as Fighter of the Year and Manager of the Year. Can you characterize your relationship with him and what that means to you to be honored like that? Like I said before, it's a huge honor. I'm very thankful, very blessed, and everybody that voted for me, all the media and all the people on all of the social outlets, different social media sites, I'm just thankful. I didn't do it by myself; everybody that's on this conference call played a major role with helping me and helping Al. Do you think Maidana is the hardest puncher that you've been in with? Well, I haven't been hit by Maidana yet, so I can't really say. I may be the hardest puncher he ever fought. He hasn't been hit by me yet, so we'll just have to see if he's the hardest puncher. How many instances have you actually even just been hurt in a fight? I remember Mosley buzzed you pretty good. How many other punches have hurt you in a fight? I'm not really sure; you get hit with good shots sometimes, but any true champion just shakes it off and just keep fighting. That's just part of the game. It seems that the only way this guy can beat you is with his power. Do you see him being able to outbox you for 12 rounds? Adrien Broner's a good boxer and he roughed Adrien Broner up and he got to victory, so we can't say what this guy, what he can or he can't do. We cannot overlook the guy. I can't just say he's going to be an easy fight because he's not going to be an easy fight for me, I don't think so. What I have to do is I've got to make sure that I'm at my best. So May 3 I've got to go out there and take my time, keep my composure and be me. Everybody thinks he's just going to be a pushover, but I don't think so. That's why I'm training hard and I'm pushing myself to the limit every day. You're 37 now and there's not a person out there who would think that you've slowed down in the least. You might even be better than you were 10 years ago. But my question is, is boxing any more or less important in your life now than it was, say, five or 10 years ago? Boxing is always very, very important to me and always will be because this has put me in a position to have everything that I have. This has put me in a position to be able to secure my family and secure myself. Boxing is something I love and that's all we know, is the fight game. But I just want to be a part of the sport. I want to help this sport live on. I want to help this sport continue to grow. That's what it's about. You can't fight forever. Have you been thinking about what you'd like to do in boxing once you hang it up? Yeah, I'm going to continue to just help Mayweather Promotions grow, I want to continue to help fighters and I want to continue to help this sport, period. 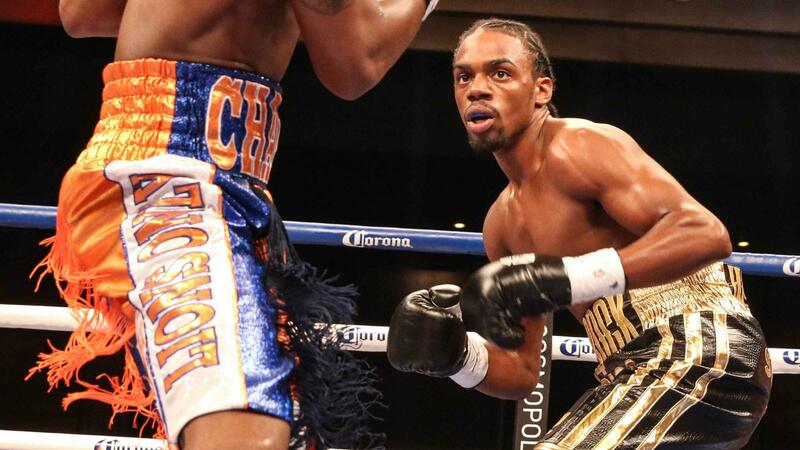 Even if they're not with Mayweather Promotions, I want to continue to keep boxing around. I want boxing to grow. We are always looking for the next Floyd Mayweather, so after this fight I have three more fights and we have to be looking for the next Floyd Mayweather, we have to be looking for the next pay-per-view star, but I think you have a lot of guys out there that can - I don't know if they can replace Floyd Mayweather, but I think they can become pay-per-view stars, and Canelo is one of those guys. Were you impressed by Canelo in his fight against Angulo? Did you see that fight? That just made your win over him seem even bigger. Canelo looked unbelievable against Angulo. I was like, this guy, he's back. What else can I say? It's the only thing I can say, that he's back. Bernard Hopkins talked about some time before he retires possibly fighting you. Obviously, he's a lot bigger than you. Have you ever entertained that thought? I mean, I think everybody's trying to hit the jackpot and fight Floyd Mayweather, from heavyweight all the way down to flyweight. I think Bernard Hopkins, I didn't get to see the fight. I think I caught the first two rounds because I really wanted to watch Kid Chocolate because he's originally from Grand Rapids, Mich., so I wanted to root for Kid Chocolate because I know he's a friend of mine and he came up watching me. But I watched the first couple rounds and I thought that Bernard Hopkins was losing the fight, I guess. Then I went for a six-mile run, so I guess when I was out doing my six-mile run I guess he picked the pace up and I guess he was victorious. But I can't take that away from Bernard Hopkins. He's a legend. He's a legend like myself and of course, you get your biggest payday when you're facing Floyd Mayweather. Floyd, in your last fight in Vegas against Canelo Alvarez, the public perception was obviously a little bit different then going into this one - bigger, stronger, he had what people perceived to be the skillset to finally be the guy who maybe knocked you off in the ring, and people don't have that same type of feeling, I don't think, about Maidana. My question is that do you worry at all about any sort of a letdown going into this fight after all the hype that surrounded THE ONE? No. You know, I try to always think positive. We always try to think positive. All we can do is dedicate ourselves and work hard and try to get good results. It's the only thing I can really say. 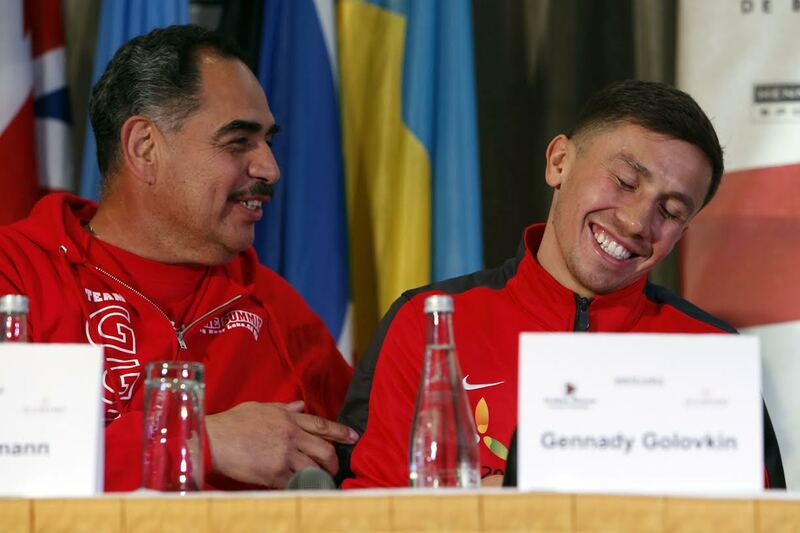 You had a fighter in Canelo that you rarely see, so that was something that everybody wanted to see, and it was more like a chess match and I was Bobby Fischer. So then, with this fight you have a guy, a rugged guy that comes straight ahead with an attitude of 'I just don't care.' He just dethroned one of the top undefeated fighters, so like I said before, it's a good matchup. Do you feel like to a certain degree that maybe you've become a little bit of a victim of your own success? You've made so many great fighters throughout your career look ordinary when they get in the ring with you. A guy like Shane Mosley, a Hall of Fame fighter, you made him look ordinary. A guy like Juan Manuel Marquez, another Hall of Fame fighter, you made him look ordinary. So do you think that maybe in the public's perception you don't get a lot of the credit for these fights not because you're not fighting good fighters but because when they get in the ring with you you're on another level and just making them look ordinary? Yes, so yes, back to that question you were asking, I think that I don't get my credit that's due because I think that I make A-level and B-level fighters look ordinary, but that comes from just having a sharp mind and just really, really pushing myself in training, pushing myself very, very hard in training and so when it's time to go out there and perform, everything is easy. If you could take yourself out of your head for a second here and not be Floyd Mayweather and looked at yourself from an outside perspective, how would you approach a fight with Floyd Mayweather? How would you train and prepare to fight Floyd Mayweather? I can't really say. How would I fight Floyd Mayweather? I don't really know. I can't really say. I just go out there. It's just second nature to me. I just go out there. It's what I've done my whole life. I was born to be a fighter. But when I was young I always loved to entertain, I always loved to promote. We've done house parties when we were young teenagers, 13, 14. 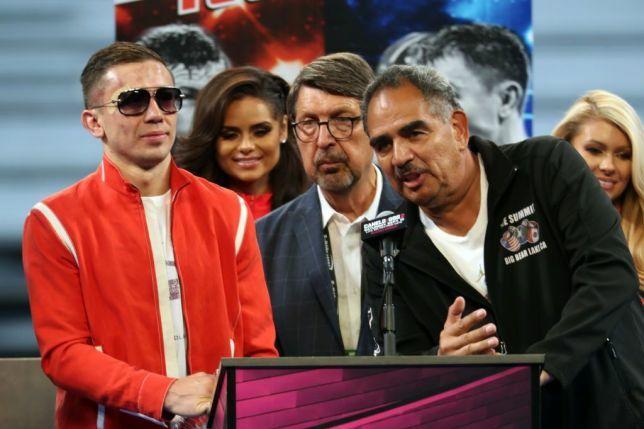 I know how to promote and make sure the party was packed, so promotion has always been something I was very, very strong in, but now that we have our own company I'm very, very happy with that, but how would I fight Floyd Mayweather? I really don't know. I really can't say. Floyd, how important is for your legacy to retire undefeated and who do you think has been the closest fighter to defeating you? As I said before, it's about being a smart. I don't go into a fight thinking about losing. It's about winning at life. The most important thing is winning at life. I don't really think about losing in the ring. I think about winning in life, just period. So as far as what guy, a lot of times people say the Castillo first fight. In the Castillo first fight I wasn't just fighting Castillo; I was fighting Larry Merchant, so he's commentating, persuading everybody to look at the fight a certain way whereas I was hurt in the fight, my arm was hurt in the fight, but there's no excuses. I know I won, and I'm not just saying it just to say it. I know deep in my heart I won. That's why if I feel I didn't win I wouldn't have fought him in a rematch. I'm saying when I did it the first time I came back and did it the same way a second time. Emanuel Agustus, but when I fought him he was Emanuel Burton. He was probably by far, I mean, well-rounded and one of my toughest opponents. And he was the guy that didn't have a real - his record didn't reflect how he fought. Normally he takes fights on a week notice, a two-week notice or a four, five-day notice whereas with me had a chance to go to training camp and prepare. So Emanuel Agustus was a very, very, very tough opponent that I faced, but we got the job done and it's not about winning - it's not about winning inside the ring; it's about winning outside the ring. The only thing I care about is winning outside the ring, it's more important than winning inside the ring. In the last hours there have been a lot of rumors about a Pacquiao-Canelo fight. Are you disappointed that Pacquiao's willing to fight Canelo instead of you in a very big fight? Well, I don't think Pacquiao-Canelo is going to (happen). I mean, me personally, I don't think so, but if that fight was to happen I'd choose Canelo to win. I don't think the fight is going to happen. Floyd, thanks a lot for hanging in there with us on this conference call. I'm going to take you to a different arena a little bit. At the beginning of the NBA regular season you made a trip to Miami and had a chance to address The Heat during practice. What do you remember from your message to them? A lot of their players still talk about what you told them and how it's motivated them going into these playoffs. Well, you know, I just talked to LeBron and told him, told all the players that each year's going to be tough. Each year's going to be tough. It's just going to get rougher, so you guys have to apply yourself like champions. I mean, you guys have to work harder. Everything get tougher and rougher and you have to work harder. That's no different for me in my position. Before I became a champion, I worked hard. Now that I am a champion, each fight I have to work harder and harder to stay in this position, so that's basically what I was speaking about to the players. Do you see any similarities between you staying on top of your game for so many years and these guys trying to three-peat and win three straight championships? Man, it's a lot of similarities, but it's different also because these guys, these guys are a team to where with me it's a one-on-one battle to where if the team loses you have to realize still, LeBron James is going to have to take all the slack to where it's no different from a fighter. If I lose, that's why I said, there's some similarities where it's a team sport, but if they lose, one guy has to deal with all the criticism to where like with me, with what I'm doing, of course I have a team, I have somebody that's going out there and instructing me. I have a team but still, it's a one-on-one sport. And you know, if something happens everything's going to fall back on me the same way. And lastly, one part of the story that they told was that you mentioned taking that shot from Sugar Shane and how it sort of rocked you and they were probably going to get rocked during the course of a season but the important thing was to come out a real, true champion, you're going to come out on your feet and withstand all the criticism, withstand all the pressure and all of that kind of thing. Do you remember that part of it? Well, I told them, like these guys are gunning for you. These guys are gonna gun for you. Even though you guys were the No. 1 in the East this year, but you're still the world champions and people are coming for that throne, so just like Canelo, he fought me one way. That doesn't mean Maidana's going to fight me the same way Canelo fought me. So like I said before, you've got to make adjustments and be able to adapt to any style. Thanks, Floyd. Leonard, would you like to wrap it up? I would just like to thank everyone for joining us on the call today. THE MOMENT, we're just 10 days away and we look forward to everyone coming to support our event. Okay, terrific. Thanks, everybody, for joining us and again. The fight week schedule's coming soon and we'll have a really great Fight Week. Thanks. Bye, everybody. ***"THE MOMENT: Mayweather vs. Maidana," is a 12-round world championship unification bout for Mayweather and Maidana's respective 147-pound titles. This is the third fight of Mayweather's lucrative multi-fight deal with Showtime Networks Inc. THE MOMENT is promoted by Mayweather Promotions and Golden Boy Promotions and sponsored by Corona, O'Reilly Auto Parts and AT&T. In the co-main event, Amir Khan faces Luis Collazo in a 12-round bout for the vacant WBC silver welterweight world title. 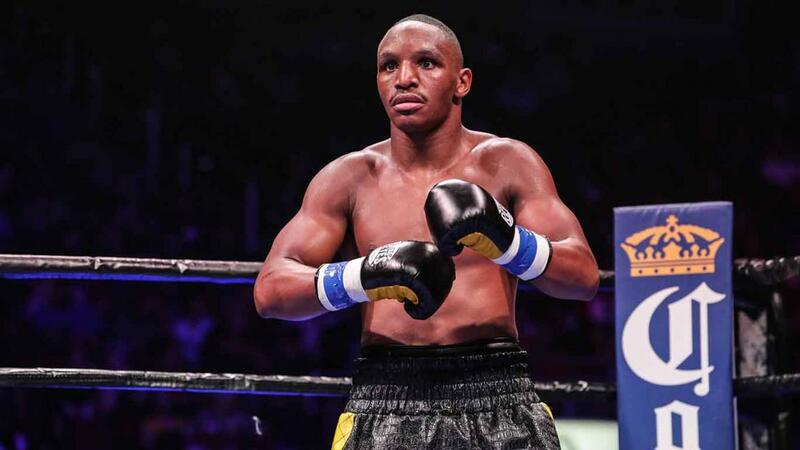 The pay-per-view undercard also features a 10-round junior welterweight fight between Adrien Broner and Carlos Molina as well as a 10-round super middleweight bout featuring J'Leon Love vs. Marco Antonio Periban. 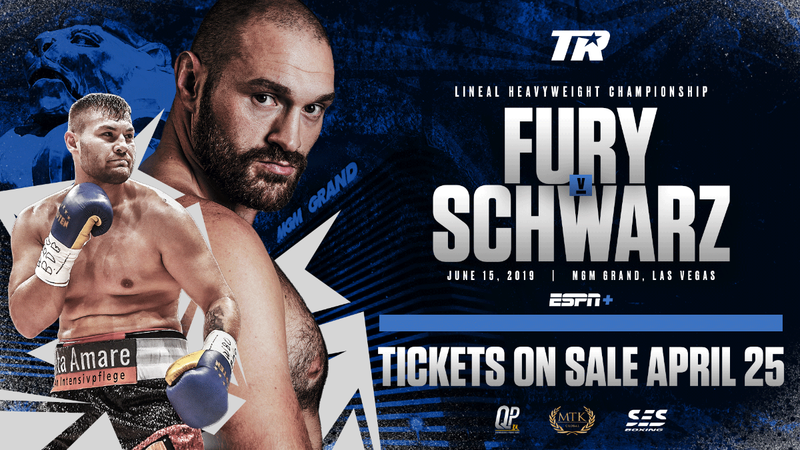 The event will be produced and distributed live by SHOWTIME PPV (9 p.m. ET/6 p.m. PT) will be available in Spanish via secondary audio programming (SAP). Tickets priced at $1,500, $1,000 and $750 are still available, not including applicable service charges and taxes. Tickets $550 and $350 are sold out. Tickets are limited to eight (8) per person. To charge by phone with a major credit card, call Ticketmaster at (800) 745-3000. Tickets also are available at www.mgmgrand.com or www.ticketmaster.com.